It’s no secret that when it comes to bike maintenance I have a lot to learn. Over a year living on a bike made me very good at making them go forward, I could do that just about all day. But when something went wrong… Well, I just had to hope that nothing would go wrong. From Journal #3 – 17th March 2015 I’m very lucky that my wonderful, beautiful, black and red bombshell of a bicycle, Dora, is very good at holding herself together. Whether we were climbing mountains, cutting through forest or dragging ourselves across sand dunes, she just seemed to keep on going. She didn’t even complain too much when I chained her to a tree, covered her in leaves, and went to party for three days. She is spectacular! But after months of almost constant use and abuse, she is a little run down. 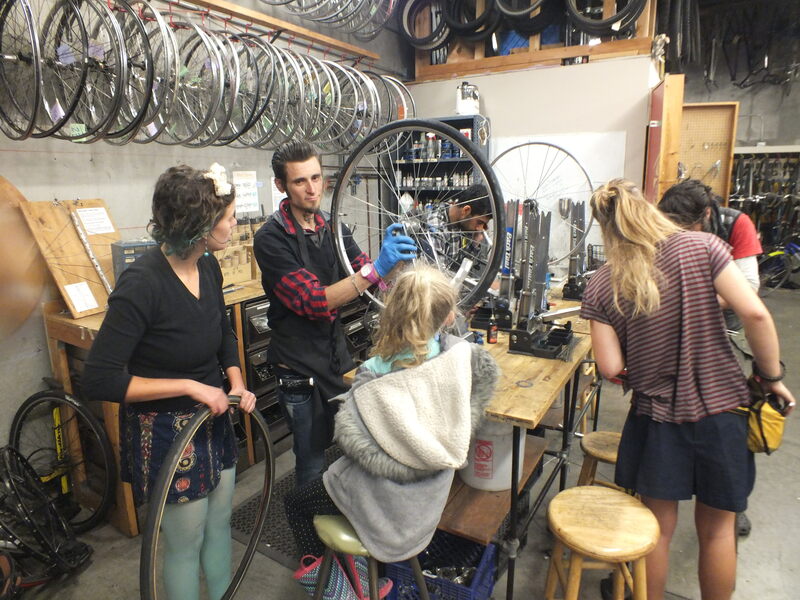 By the time she arrived at The Bike Kitchen, a non-profit, volunteer based community bike repair workshop in San Francisco, she was ready for a little TLC. The fact-y bit. The Bike Kitchen opened in 2003 to provide an affordable way for members of the community to repair, and crucially, learn to repair, their own bikes. Use of the tools and the help of the volunteers, some of whom are giving their time to both learn and teach bicycle maintenance, costs $6, though no-one gets turned away. It doesn’t cost much become a member ($50-$100), and, for a little more (or by volunteering your time (6 hours)) you can build your own bike from scratch with parts from the workshop. I was welcomed into a kind of bike heaven. The walls were lined with frames, wheels and all manner of bike body bits. Against the back wall were the tools, parts, teaching aids and a bench set up with devices to help true wonky wheels. On the floor of the shop stood bike stands and tool benches, enough for more than ten people to tinker with their bikes at a time. It was packed, but Dora needed help, and that was about the time that Cullin, the bearded benevolent, came like an angel to my aid. Dora required a new rubber washer for her headset, as the handlebars wouldn’t turn without grinding. Plus, she needed some new pedals as hers had been leaking ball-bearings across Asia. The pedal problem was soon sorted but the headset seemed to be a bust. An examination revealed that she really needed a whole new headset, which would have cost too much, and fitting it requires special tools. But she was in the right place. The Bike Kitchen had the tools, and Cullin had a brand new headset that he would very kindly donate. This was the most serious surgery Dora had undergone, involving several tools that looked like medieval tools of pain and torture. Then there were the minor surgeries, and a medium sized one that involved bolt cutters and a hacksaw. Brakes needed adjustment, gears were wildly out of alignment, bolts were missing and metal was bent out of shape. The Bike Kitchen’s greatest feature is that it is full of other people working on bikes. They help each other, learning through observation and conversation, working in twos or threes to solve their bikes problems. 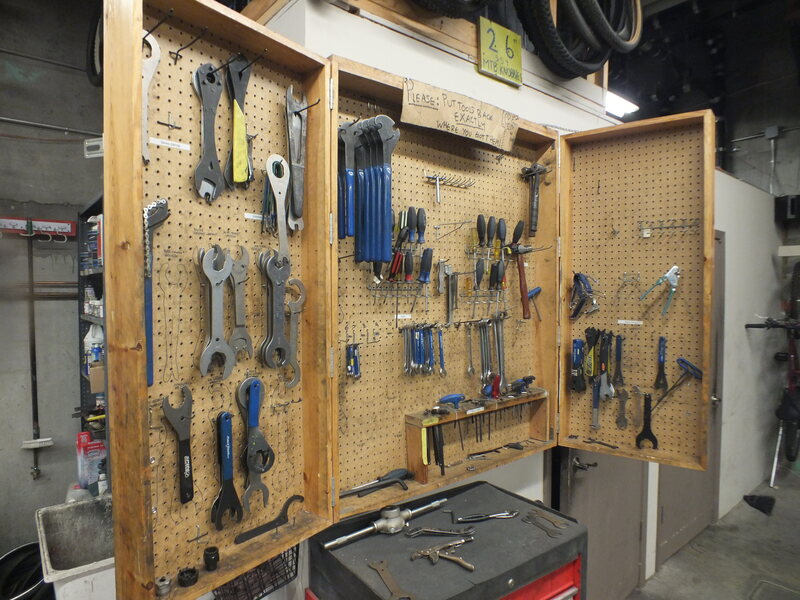 It’s safe to say that just a few days spent in the Bike Kitchen will teach you more about bikes than a year of actual cycling, largely thanks to the volunteers. Enthusiastic, friendly and helpful, everything that your average bike mechanic isn’t, and generous to poor bikes and even poorer cyclists. Most are very knowledgeable, and the others are working (with sunshine smiles) to get to that point. Once Dora was in better working order than I thought possible, it was time to clean up the workshop, and get back to my Warmshower host. Before we could leave, however, the guys at the Bike Kitchen had one more gift to give. Dora was safe, unlikely to breakdown any time soon, but me, without a helmet, couldn’t claim the same. Thankfully, Richard, another volunteer, offered me a helmet to replace the one I’d misplaced in Thailand (the one that my dad gave me and told me not to lose). Oops. Over the next 3 months I visited similar projects. Bike Saviours in Phoenix, Arizona. BikeWorks in Silver City, New Mexico. The Yellow Bike Project in Austin, Texas. Each had its own character and its own characters, but they’re other stories. Dora has many to tell, now that she’s retired.